The U.S. Air Force's launch of the next secret mission by its unmanned X-37B space plane has been officially delayed to mid-November. The upcoming X -37B space plane mystery mission, also known as Orbital Test Vehicle-3 (OTV-3), was slated to blast off atop an Atlas 5 rocket on Oct. 25 from Space Launch Complex 41 at Cape Canaveral Air Force Station in Florida. The liftoff is now scheduled for Nov. 13, according to ULA. The delay was announced Saturday (Oct. 20) in an update by the mission's launch provider, United Launch Alliance (ULA). ULA officials said an engine glitch during an Oct. 5 launch of a Delta 4 rocket that successfully orbited a Global Positioning System 2F-3 satellite. An unexpected lower than normal chamber pressure was observed on the booster’s RL10 upper stage engine. The onboard inertial guidance and flight control systems compensated for the lower thrust, with the Delta second stage placing the spacecraft into the proper orbit. While the Atlas 5 being readied to hurl the OTV-3 into Earth orbit utilizes a different model of the Pratt & Whitney Rocketdyne RL-10 engine, both the Air Force and ULA concurred on the launch postponement. Air Force Space Command Commander, General William Shelton, asked for a discretionary accident investigation board (AIB) to investigate why the Delta 4 RL-10B-2 upper stage engine did not perform as expected. Per standard processes, the Air Force reviews all flight data to determine readiness to proceed with the next liftoff. Formed in December 2006, ULA is a 50-50 joint venture owned by Lockheed Martin and The Boeing Company. ULA provides the expendable Atlas and Delta boosters for U.S. government launch customers including the Department of Defense, NASA, the National Reconnaissance Office and other organizations. When the OTV-3 mission lifts off, it will mark the 34th Atlas 5 rocket launch since its inaugural launch in 2002. Atlas 5 vehicles also launched the OTV-1 AND OTV-2 missions. 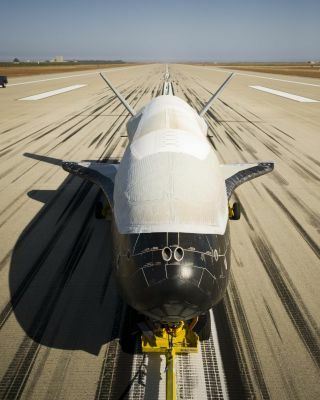 This third mission of the winged X-37B spacecraft also marks the first re-flight of the reusable space plane. The same vehicle flew the first flight in 2010. That maiden journey of the unpiloted space plane lasted 225 days, zooming in on autopilot over the Pacific Ocean and gliding down onto a specially prepared runway at Vandenberg Air Force Base in California. Similarly, a second X-37B spacecraft flew on the OTV-2 mission, making a touchdown at Vandenberg on June 16 of this year. The second mission remained in orbit for 469 days, more than doubling the 225-day mission of its sister ship. The two space planes are built by Boeing Government Space Systems. They are each 29 feet (8.8 meters) long and 15 feet (4.5 m) wide, with a payload bay about the size of a pickup truck bed. Exactly what payloads have been, and will be, flown inside the space plane’s cargo bay is classified. Flights of the X-37B are conducted under the auspices of the Air Force’s Rapid Capabilities Office which has a mission of expediting the development and fielding of select Department of Defense combat support and weapon systems by leveraging defense-wide technology development efforts and existing operational capabilities. There has been discussion of landing the X-37B space plane on the space shuttle runway at NASA's Kennedy Space Center in Florida. However, it’s early in the process for those considerations, USAF Major Tracy Bunko at the Pentagon’s Air Force Press desk told SPACE.com.